Hope this finds you well. I’m Grace from Indonesia. I’m a Christian girl, a pastor-daughter, a teens-ministry teacher, and an amateur Christian-devotional writer. I just finished reading your novel Goodnight to My Thoughts of You. 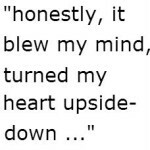 And honestly, it blew my mind, turned my heart upside down. Your novel touched me deeply. Thanks to you. At first, I did not want to read the entire novel, as the novel has two parts which I literally thought this would be a long way to go to read the entire parts. But the title successfully persuaded me to little by little, digging out each chapter. And here I am writing you an email just one day after I completed reading it. I experienced so much fun, joy, and even tears in your novel. It was so powerful. I can see the reflection of my self in Miriam character. (Well, it is not 100% of her, but may be around 65%.) There are several questions in my mind that have been answered in your novel. Thanks to you once again. 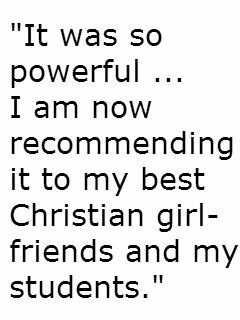 I am now recommending it to my Christian best girl friends and my students. Your novel has also motivated me to start writing my own Christian novel (love story about my parents, 😀 since I’m still “Lady in Waiting” mode) to encourage my girls in church to stay pure in the eyes of the Lord before marriage. It is most likely in Indonesian language. For your information, it is so rare to find a Romance-Christian-based-novel in Indonesia. I am really looking forward to read your next novel Heavenly Here With You. May God bless you through the writing process for the sequel. God bless your husband and the children. When I read stuff like this, I just cry and thank God for such a blessing. I mean, Indonesia? How awesome is that?! I have prayed for you a few times already since I received your email — I prayed for you tonight too. I thank God for you and your sweet spirit! I hope I can express how grateful I am for your response to my novel; I am just praising God because my story has touched your life–all the way in Indonesia. And we have a sisterhood and a kindred spirit in the Lord Jesus. How amazing! I am so excited for you to write your parents’ love story. I would love to read it. If you look on my blog in the category called “On Writing” you will find a series of 5 posts about “how to start writing your story.” I hope you find them helpful! Please pray for me as I continue to write and prepare the next few novels. I praise God for the riches I have received from your encouraging words. God bless you, sweet Grace! One day soon you will know why your email came to me in perfect timing. Trust the Lord; he is so good. P.S. May I quote your email on my blog? P.P.S. Please leave a review of the book at one or both of these websites (Amazon and Barnes and Noble) so other girls will know you enjoyed reading it! Thanks! I was so happy to read your email. Thank you for your encouragement on my writing. I’ll take your advice and read in your blog. When I finish my writing, I’d like to share it to you. But may be it will take a longer time, since I am going to write in Indonesian language first to reach Christian girls community here. I must admit that in Indonesia, there are very limited sources for Christian novel, theology and or motivation for youth written in our language. If we have any, it must be in English and compared to the majority of population who barely speak English, our teenagers / youth are inadequate to read it comprehensively. Yeah, this is a very sad condition. That is why I am hoping I can be a good writer to share God’s love to the next generation. I have prayed for you to finishing the sequel of your novel for several times. I prayed that the Holy Spirit will bless you with wisdom and creativity to present a fresh story that speaks to the deepest soul of your reader just like the first one. PS: It is my pleasure if you’d like to quote my email on your blog. P.P.S: I also have written reviews for your book in those links above. Hope there will be more readers discover your book. Oh my goodness. Thank you Jesus! Hey there! Have you read my novel Goodnight to My Thoughts of You ? It’s not too late to get your free copy of the ebook, or leave a review so other girls will know you liked it! And don’t forget to subscribe to the blog so you can get free email updates!